Ever since I read the menu I have been hanging out to get myself to The Merrywell. The newest addition to the ever increasing plethora of restaurants at the Crown Perth, this one comes courtesy of an American fellow called Sammy DeMarco. His first restaurant was in Atlantic City, but since then he has expanded his empire and has new ventures in Las Vegas, Melbourne and in James Packer’s infinite wisdom we now have our own in Perth. His menu is a tribute to dude food, a recent craze that has swept the West and his offering is right up the alley of anyone who’s a fan of these fun food options. The Perth restaurant seats an impressive 400 people and bookings can only be made for groups of 10 or more. Knowing this and as it was a Saturday night we decided we’d try our luck and left early, arriving around 6pm. Thankfully given the size of the place and as we were only a group of 2 it was no drama to get a seat. Our friendly waiter bought us some iced water and menus and now the tough decisions -what to have?? As with a recent visit to Bistro Guillaume, I was very impressed with the way the drinks menu was structured. Some reasonable priced options available, but if you are in the mood to splash cash then you can do that too. We went with wine by the glass on this visit, white for the ladies and red for the gents as is often the case when GG and I dine. I ordered the Tahbilk Marsanne 2011 Nagambie, Victoria ($8) and GG the Capel Vale ‘Regional Series’ Shiraz 2011 Margaret River, WA ($13). When our drinks were delivered, this was the first blight on our happy visit. There were a few lipgloss smudges on my glass when it arrived that didn’t belong to me. Thankfully though as soon as this was altered to our waiter, after some profuse apologising a fresh glass was bought over. Problem solvered. So onto the food. While there were some really interesting options available on the mains menu section, I… well we were keen to try as much as possible so decided to choose from the shared plate selections. To assist in the tricky choosing process they also highlight with orange text the house specialities. That definitely helped us select which four plates to start with. Couldn’t go past the Mac & Cheese Bites House HP Dip ($15). 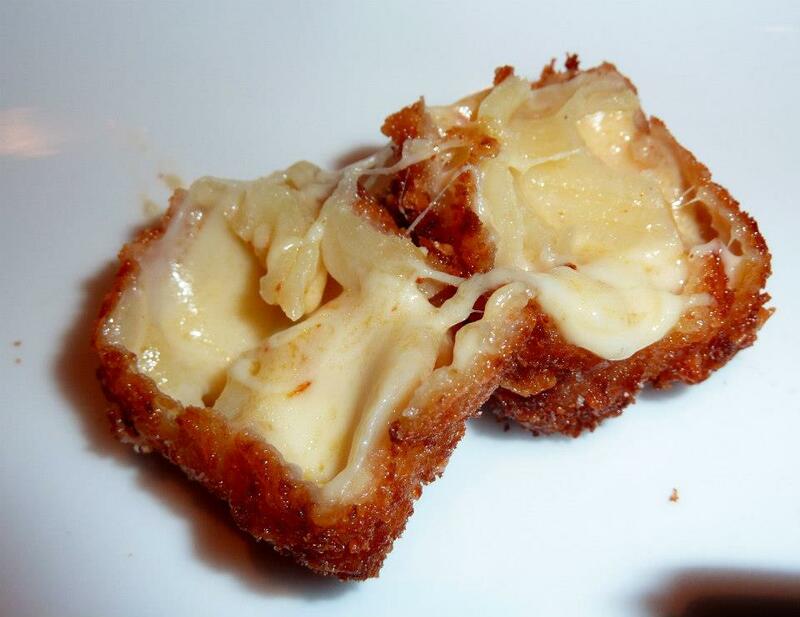 I mean deep fried pasta and cheese cubes, the whole idea is just dreamy! The decadence of them was just too hard to resist and they really lived up to all expectations. Especially with their own HP Dip, what a perfectly wonderful combination. They weren’t too oily or heavy, just indulgently yum! 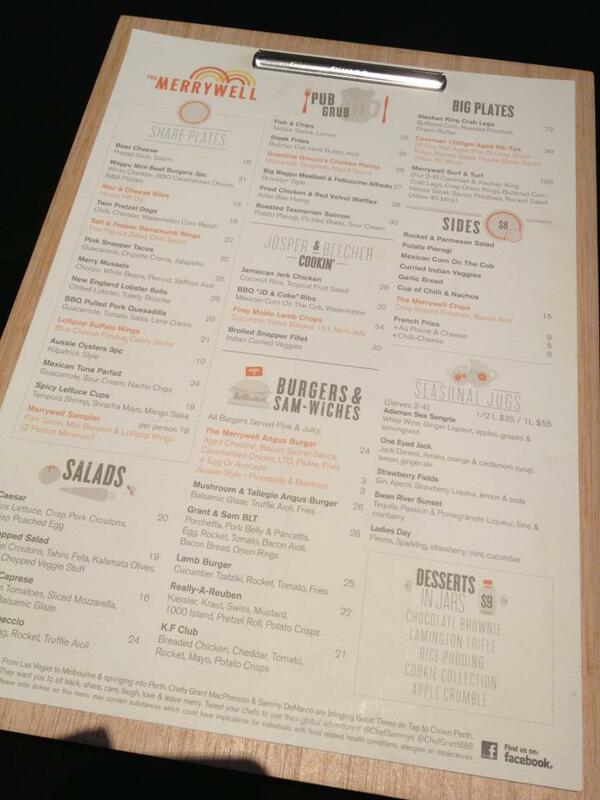 They are in orange text on the menu for a reason – a total crowd pleaser. 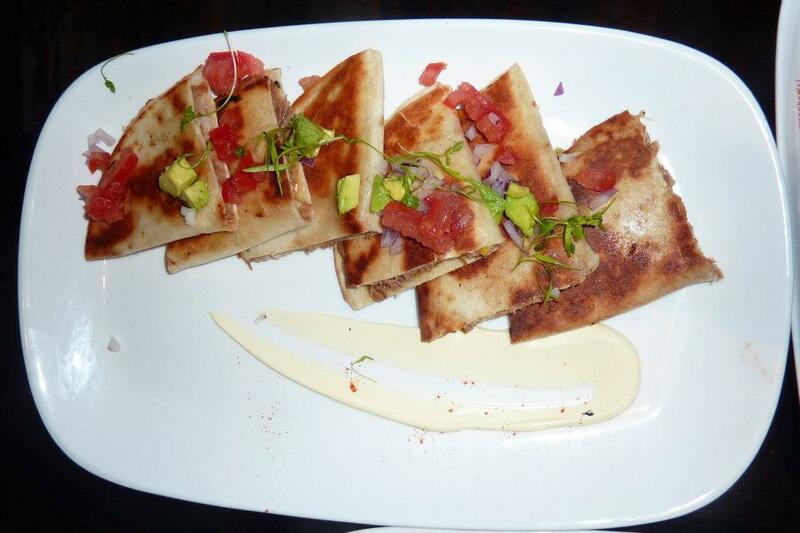 And GG and I are both long time fans of all things pulled pork so we locked in a serve of BBQ Pulled Pork Quesadilla Guacamole, Tomato Salsa, Lime Crema ($20). There was actually a fair bit of sweetness to this dish as their was also corn kernels in with the pulled pork. The meat just melted in your mouth and the salsa and lime crema really added a refreshing finish to the whole plate. Another tick. 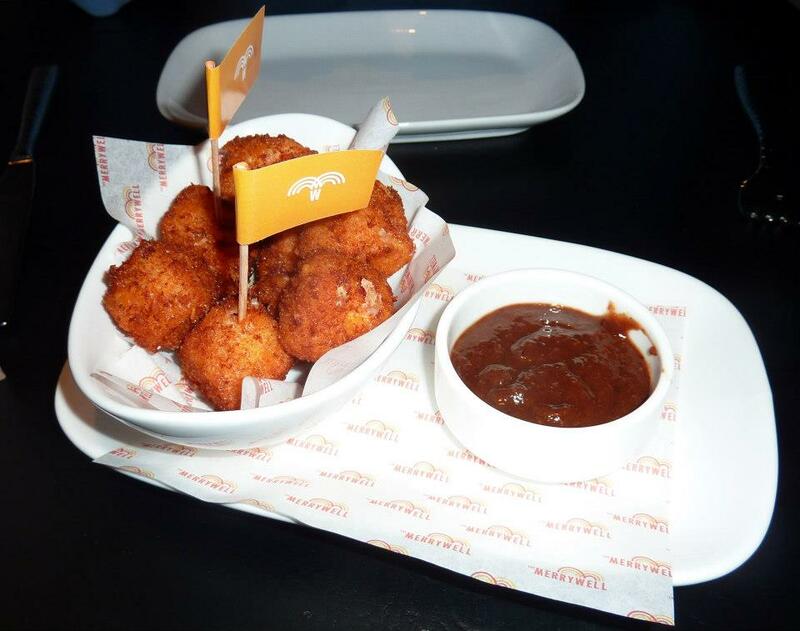 Our next orange texted menu item was the highly anticipated Lollipop Buffalo Wings Blue Cheese Fondue, Celery Sticks ($21). They looked entirely precious and how in the world did they make these little bubby wings?? It was like magic with their tiny little bone handles and they were just bursting with flavour. The right amount of spice and then a dip into the creamy blue cheese sauce and ooo la la you were set. These were easy eating little morsels. 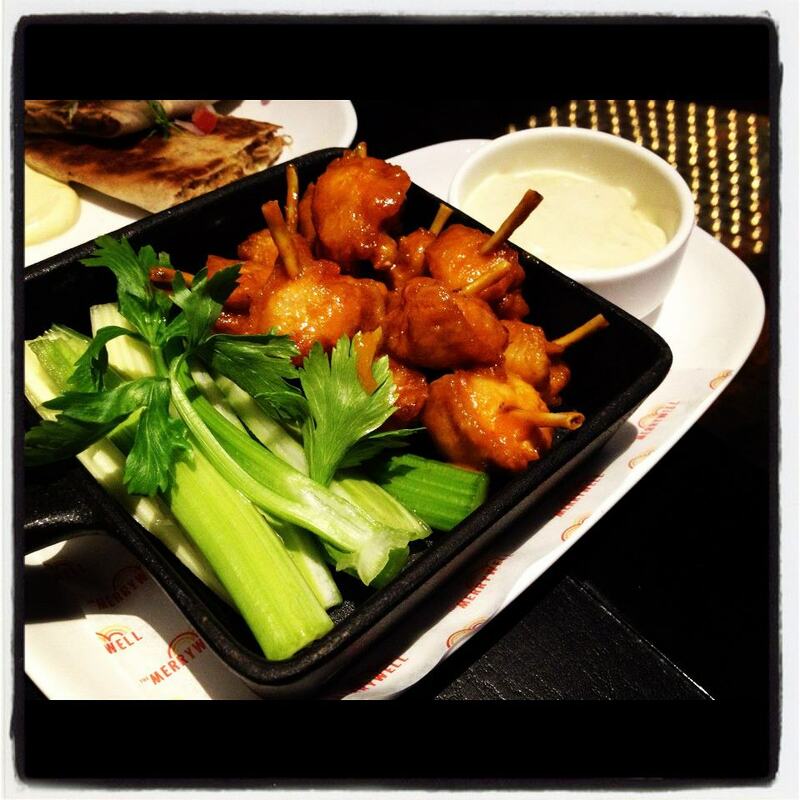 Very easy to work your way through a plateful – yum! Our final savoury dish was something that sounded like nice and light and a nod to my new found appreciation for things of the fish persuasion – Mexican Tuna Parfait Guacamole, Sour Cream, Nacho Chips ($24). The perfect little tower was quite the vision when it arrived. 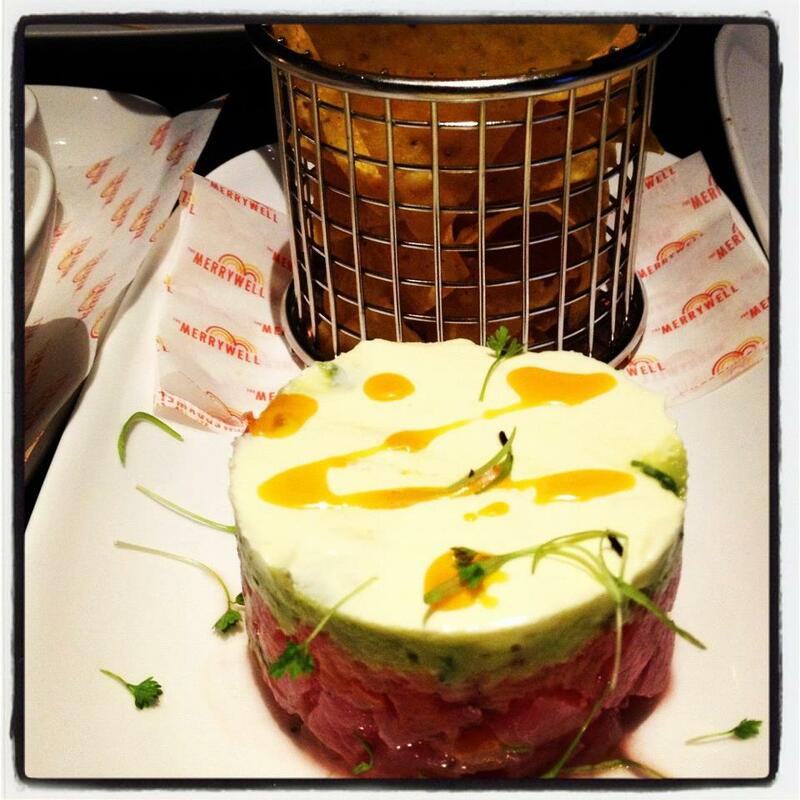 The tuna was fabulously fresh and well paired with the creamy guacamole. The serve of nacho chips was generous and added the right amount of contrasting crunch to make this an all around great choice. And it was on the lighter side as we had hoped. Despite feeling more than comfortable after these 4 dishes, we still had a little more room to choose something from the Dessert in Jars menu – yay! I asked our waitress what her favourite was and she noted that as a chocolate fan it was very hard to go past the Chocolate Brownie ($9). She had us both at chocolate so in an over the top indulgent move we ordered one each. This was where the second slight mishap with our visit occurred. 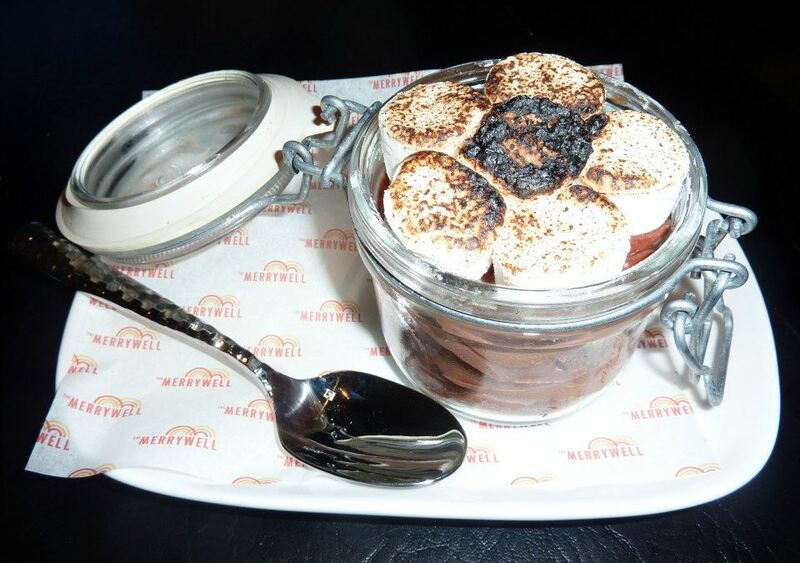 Despite ordering two serves only one little jar arrived. We confirmed on our bill that we had been charged for two, but seemed like it would be a bit of a bother to wait for a second so just asked for the bill to be updated. As it turned out sharing one of the desserts between us was definitely the way to go as they were wonderfully rich, particularly with the torched marshmallows on top. 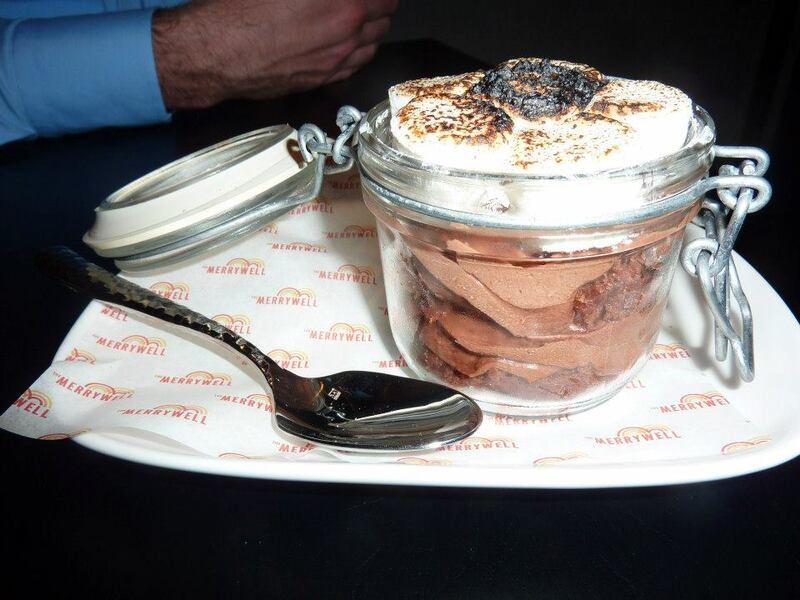 Just divine and serving them in jars – all kinds of trendy! I really had high expectations for this place, but it had lived up to the hype. Delicious food, our waiters had been friendly and attentive and helpful in correcting the few problems we’d had on this visit. Plus it’s early days so hopefully they are just a few teething issues. Regardless, I’m really looking forward to heading back and trying out a few other menu items. Definitely having the lollipop buffalo wings next time I go. We only ducked in here for a drink pre-Bistro Guillaime but are dieing to head back. I mean ..its onyl 5 mins from my house so why not? Ooops dying I mean not dieing! It’s a lovely spot and I saw you had a drink there last night? He he yes we did. Gotta get back for the food though! The food looks great! The Merrywell Perth is one of the best Perth bars for a Friday drink. Definitely worth checking out if your at Crown.